The Mellon Arena is home to the NHL’s Pittsburgh Penguins and more importantly was the setting for the 1995 Van Damme “classic” – Sudden Death. 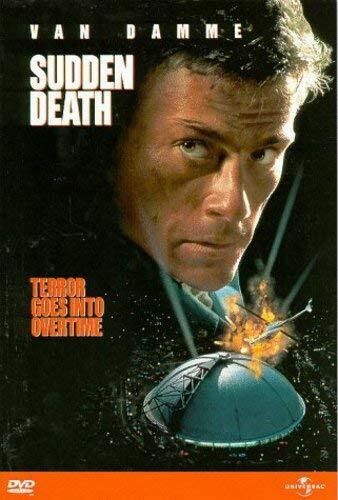 The arena was even on the movie poster along with an exploding helicopter. The “radio tower” looking part is actually a 260 foot cantilever arm designed to support the eight steel ‘leaves’ that can fully retract in just 2 minutes. At 170,000 square feet it is apparently the “largest retractable, stainless steel dome roof in the world” – although I doubt there’s much competition for the title. Roughly east of the Mellon Arena is another large circular building. Anyone know what it is? PNC Park (baseball Pirates) and Heinz Field (football Steelers) are just to the west of Mellon Arena. That would be the Petersen Events Centre, the University of Pittsburgh’s indoor sporting venue. Wikipedia says that the roof can no longer open all the way- I guess putting a hanging scoreboard did that function in. As a Pens fan and burgh resident, (I can see the building in question from my street) I know quite a bit of Civic Arena (the original name of the building) or as we call it “the Igloo” lore. The dome can only be retracted if the massive scoreboard is removed, and the hundreds of cables hung from the ceiling are removed. Needless to say it is a huge undertaking. The last time it was done that I can remeber was at least 4 or 5 years ago when they were cleaning the outside of the dome. During the filimg of the movie, they actually blew up the scoreboard, which was like 20 years old and needed replacing anyhow. The new scoreboard/screen is a massive thing, but has made it nearly impossible to ever open the dome again. Oh and yes they did name the street that goes by the arena after the most famous player/owner in the NHL.